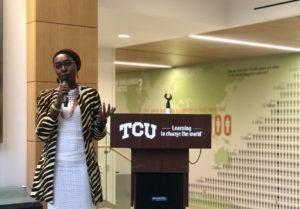 TCU celebrated the public launch of the School of Interdisciplinary Studies Thursday and gave students an insight on how the programs impact the community. The mission of the new school is to empower change through multiple perspectives, academic disciplines and methods of inquiry. One program that helps establish this mission is Intro to University Life, which helps first-year students transition into TCU’s academic community. Dr. Karen Steele, dean of the School of Interdisciplinary Studies. Photo via Oscar Hernandez. 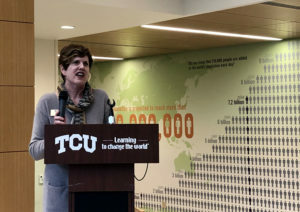 “We take big problems and make them the center of our inquiry, we tackle them by connecting experts, ideas and communities in pursuit of empathy, respect and justice, they are the driving values of the new school,” said Karen Steele, dean of the School of Interdisciplinary Studies. The new school offers interdisciplinary programs through majors and minors in comparative race and ethnic studies (CRES), women and gender studies, intensive English and ranch management. Students within these academic departments shared their insights in how these interdisciplinary programs helped shape and empower change in their field. Hope Bentley, fourth-year psychology major and minor in CRES. Photo via Oscar Hernandez. Through CRES, many students can learn more about issues that are persistent in our world while also providing a home for learners, fighters, activists and those who need a place to belong, said Hope Bentley, a fourth-year psychology major with a minor in CRES. J.R. Hardy, a fourth-year double major in communications and women and gender studies, shared how his learning experiences as a male helped shape his mind about empowerment. David O’Hara, who studies ranch management, appreciates the industry expertise he receives. “We get to travel to different ranches across Texas, Kansas and Oklahoma and see how different operators work,” O’Hara said. Students who come from international backgrounds also benefit from these interdisciplinary programs. Sakina Usengimana, a student from Rwanda in the Intensive English Program, said this program encourages us to go out, speak and learn more about the language by applying ourselves to various inclusive programs within the community. Sakina Usengimana, studies under the Intensive English Program. Photo via Oscar Hernandez. The School of Interdisciplinary Studies also informed students on how they can utilize FrogFolio and IdeaFactory. 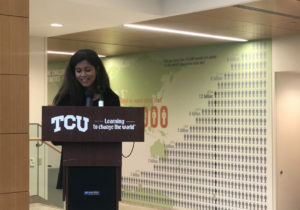 FrogFolio gives students an opportunity to archive and reflect on their different experiences or projects they may have engaged in at TCU, said Jacob Buttry, eTern for FrogFolio. IdeaFactory gives students an opportunity to offer unique and different perspectives in how we can have an impact on the campus community. Neeley Navigators, a program assisting first-year students, would not have been possible without IdeaFactory, said Nick Gorino, a fourth-year business major. Students and faculty who are interested in being involved with the School of Interdisciplinary Studies can visit the dean’s office located on the third floor of Rees-Jones.